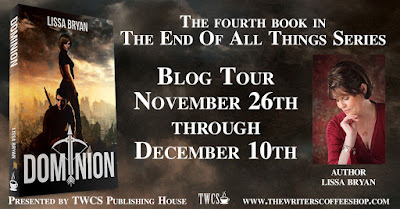 When I finished Shadows Have Gone (The End of All Things #3), I had hoped that there would be a follow novella if not a full length novel to see if the utopian-ish town Carly and Justin had set up would endure and if it did would it expand. So I was very happy to see Dominion by Lissa Bryan coming out. 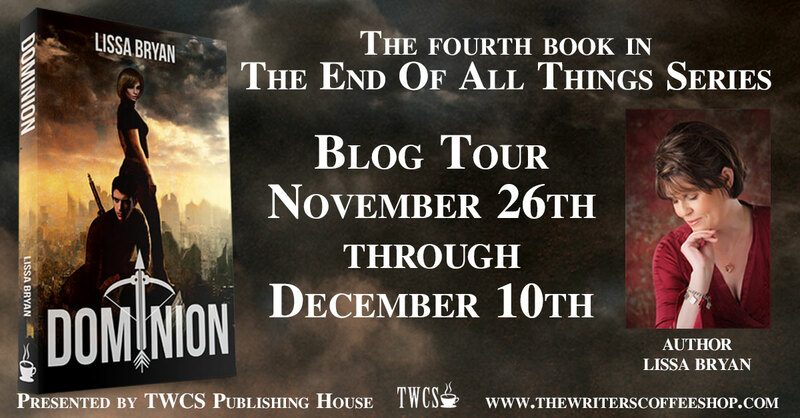 Dominion takes place about 30 years after the end of book 3 and somewhere in the Appalachian Mountains - in the coal country (so in the Kentucky, Tennessee, West Virigina area). The story starts with a bang, quite literarly. The town is being raided by the a gang of thugs, though this isn't a random group of bandits, but The Nine - a violent group that reigns over the region much like the mafia. Taylor, who lives on the outskirts of town, is able to grab her go bag and head for the fence line. Unfortunately she doesn't get away undetected and must fight her way out. She kills one of the Nine immediately making her a hunted woman with a large bounty on her head. She escapes to a cabin in the woods, but she soon discovers she wasn't the only one to escape. The major's son Dylan also made the unlikely escape from town. Now he risks death in the wastelands as he has lived a relatively pampered life and has no survival skills. Taylor and Dylan make an uneasy pact to travel together and so starts their adventure. There is mention of Haven, the town Carly and Justin started, as Dylan's mother came from there and that is directon Taylor and Dylan head as they have no idea where else to go except out of The Nine's territory. There are a number of similarities between Dylan and Taylor's journey and Carly and Justin's. In a reversal of roles, Taylor has the survival skills and they aren't trying to avoid the infection, but the land they are in is just as hostile as the land Carly and Justin traveled through and they are never sure if they are coming upon friend or foe. Even with the similarities, it was still an enjoyable story. Like the books before it, Bryan's storytelling sucked me in and I couldn't put the book down. The world in which the characters find themselves is an unpredictable one. A simple cut could mean life or death as there are no antibiotics and even clean water is hard to come by. In 30 years, some progress has been made as more towns have been set up, though there is no overall governance. It is more like the early frontier days when people lived in walled towns and are only allied with other towns for trade purposes. As Taylor and Dylan are in a harsher climate it is understandable that more progress hasn't been made. If you haven't read the first 3 books, that's okay. 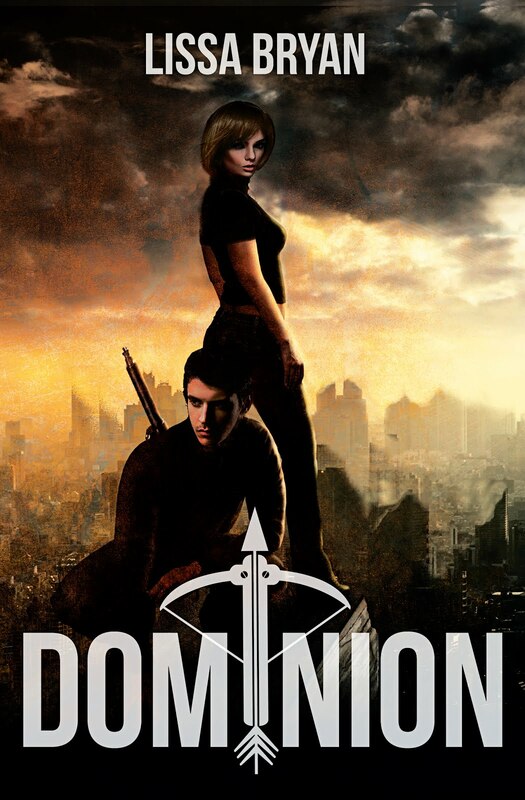 Dominion reads more like a spin-off than a sequel. If you enjoy post-apopoclyptic fiction, then this series is one of my favorites and I highly recommend reading it. Donna is an avid reader and natural encourager. She is the founder of Girl Who Reads and the author of how-to marketing book Secrets to a Successful Blog Tour. Thanks for sharing your thoughts, and thanks to Lissa for the books!